Circle 19, the largest of the circles at Carrowmore looking west with Knocknarea in the background. 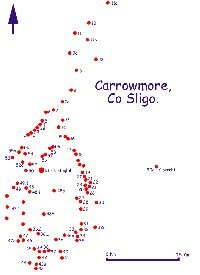 Site 19 at Carrowmore is the largest of the monuments excepting the central cairn at Listoghil. 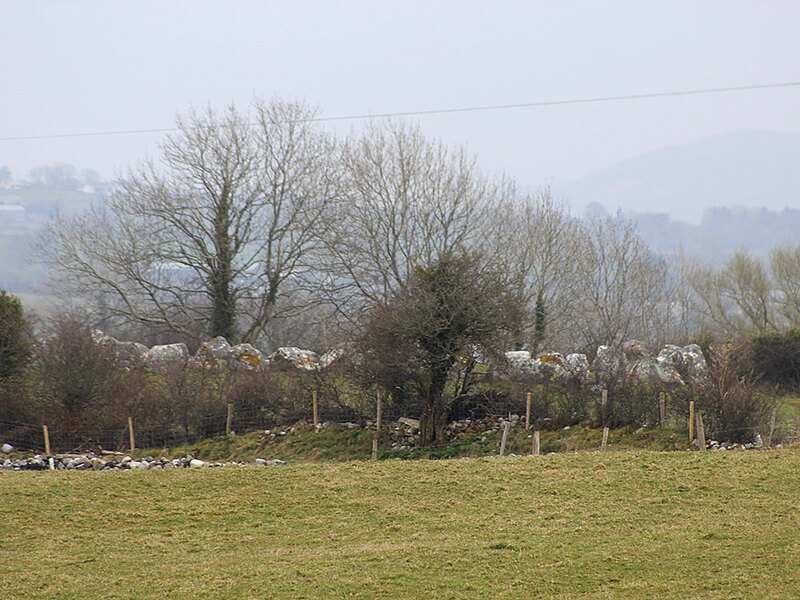 There are 44 large boulders placed in a ring 23 meters across on a rised platform, as are many other circles at Carrowmore. The boulders are quite large and have been set standing up, as with nearby circle 27, which gives the site a very imposing appearance. Some of the boulders had slipped into the quarry on the north west side, but these were replaced in the late 1990's. The only evidence of a central construction are two slabs set at right angles, just off the centre of the circle. Three small stones may indicate a smaller inner circle. Wood-Martin found a massive amount of unburnt bones here (listed blow), which probably date from a later period. The site is easy to access, as it is close to the road with both a gate and a stile. It is on the right hand side of the road as you proceed south. Sites 26 and 27 are located close by. 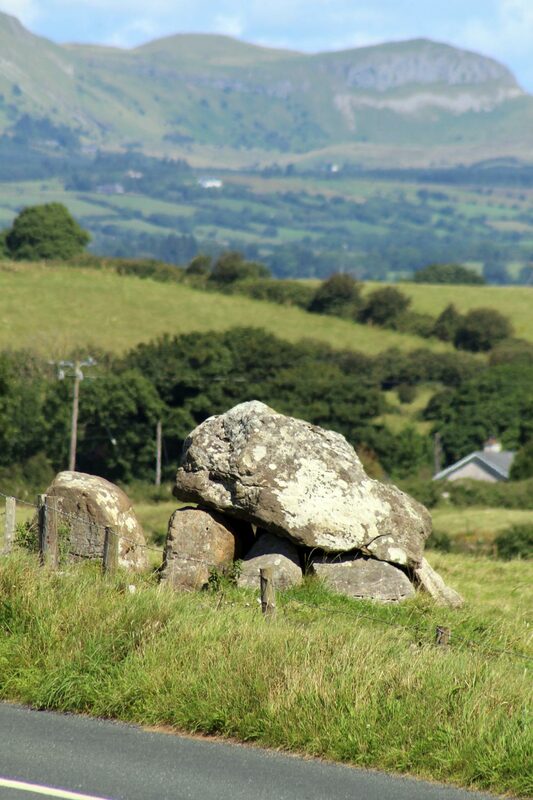 They are the grandest of the Carrowmore circles. Circle 19 viewed from the central monument. Situated south of 15 (dolmen-circle (several dolmens or cists)). "This circle is the grandest of the whole series now remaining. It is 72 feet in diameter, and consists of forty-nine stones, the original number being apparently fifty-two. These stones are all of great magnitude, and many of them are 7 feet above ground. It had evidently several kistvaens, or cromleacs, within it, of which the remains are visible, as well as one outside the circle, on the west, the stones of which remain." - Petrie. "Being placed on an artificially-raised mound an imposing appearance is produced. The mound, however, has been undermined by people seeking for gravel, and some of the boulders on the northwest have rolled to the bottom of the slope.... An excavation into what was apparently the site of the central chamber showed that the interment had been greatly disturbed. One flag only of the original flooring was left in situ, but the largest collection of uncalcined bones discovered in Carrowmore has here exhumed." A long line of contiguous stones, terminating in a large one on the northwest side of the area, looks like one side of the passage into a dolmen from the edge of the circle. Among the bones discovered "there were portions of jaw-bones, with the teeth still adhering; in short, the human remains were in a less fragmentary state than in any of the other circles examined. On the clay being carefully sifted, three or four pieces of bone among all the uncalcined pieces proved to be calcined." - Wood Martin. These remains were submitted to Drs. MacDowel of Sligo, and Frazer of Dublin. The former stated that, "beyond doubt, they represent human remains. Some of the bones are those of a child, others those of an adult, and some those of an individual of advanced years. The bones belong to an undersized race. Amongst them there is also the femur and incised tooth of an ox." Dr. Frazer reports as follows: "I find four heel bones; three of them belong to the right feet, and one to the left foot. There must, therefore, have been three different interments of separate bodies; but I cannot refer the other bones found with them to the individuals. I find fragments all belonging to a large and well-developed male, such as upper end of humerus, femur, tibia, and ulna. ; also portions of small sized individual, possibly a female - I should say not young - namely femur, top of radius, and part of platycnemic tibia. Teeth and portions of jaws of adults of advanced life - at least in full maturity; also part of skull of small cow, and leg-bone and vertebra, possibly of a small horse, about which, being broken, and having no bones for comparison, I cannot, however, speak positively. There were some teeth of calf or small cow, and two teeth of a small dog or cat. The rest consist of numerous fragments, which would require hours to examine. . . . all appear to belong to an early race."